Chelsie Giles defeated a number of higher ranked opponents to claim Bronze on a fantastic first day of competition at the 2018 Budapest Grand Prix in Hungary. 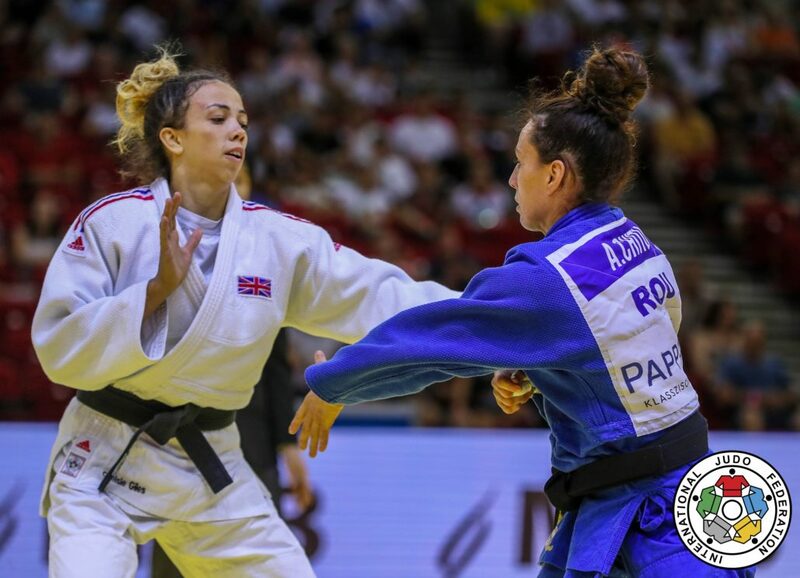 The Coventry judoka left form World and European Medallists in her wake in a frantic display of judo to give her a second Grand Prix medal following a maiden medal with Silver at the Antalya Grand Prix in April. Victory over experienced Andreea Chitu from Romania handed Giles the deserved medal. Chitu came flying out of the blocks early on with Giles on the back foot for the majority of the opening minute. Just as the Romanian was starting to build momentum, Giles spotted her moment and countered an attempted throw to score waza-ari and force Chitu to the mat. She pounced on her vulnerable and secured an arm lock to force Chitu to submit and claim her placed on the podium. “I feel like this is the best I have performed in competition. The new techniques I have been working on in training are now paying dividends and to come away with a medal, I am so happy!” commented Giles. Giles started the day in fine fashion in Budapest as she eliminated the World No.13 in under one minute. Switzerland’s European Championship Bronze medallist Evelyne Tschopp could not handle the high intensity performance from Giles as she stormed out of the blocks and immediately put Tschopp under pressure. Giles looked fresh and energetic in her second round contest against Italy’s Giulia Pierucci and immediately went on the offensive. She had lost her two previous contests against the Italian so was out to avenge those defeats. Both athletes possessed a similar fighting style to each other and as such, took a little time to get to grips with each other. Giles managed to score via ouchi-gari to give her the lead with 30 seconds left but found herself under increasing pressure from the Italian in the closing stages but to no avail. Gili Cohen from Israel laid in wait for Giles in the Quarter Finals, but she would prove one hurdle too far as Cohen was able to register two waza-ari to drop Giles into the repechage. She almost secured a spectacular victory at one point which drew gasps from the crowd, only to see Cohen rotate and land on her front. A very quick turnaround saw Giles back on the mat in the repechage against Spain’s Nina Esteo Linne with an eye on the bronze medal contest later in the afternoon. It was a quiet opening to the contest but Esteo Linne showed little attacking until the halfway stage but Giles was equal to any attack. Giles tried on multiple occasions to take Esteo Linne to the mat and on her second attempt was able to secure an arm lock on the Spaniard which eventually forced her submission. “Today I saw a Chelsie that can fight and mix it with the best girls in the world. Hopefully this will be the spring board for the next competition. The experience at this level is invaluable and she knows there is a long way to go but she is heading in the right direction. Bekky Livesey (-57kg) and Kim Renicks (-48kg) both suffered early defeats in Budapest as they were eliminated in the opening rounds of their respective categories. It was a tentative contest between Livesey and Bulgaria’s Ilieva Ivelina as each judoka took time to adjust to each other’s style. Ivelina’s experience eventually shone through though as she registered a waza-ari after working Livesey to the mat and used her momentum to lock her onto the canvas to register a second waza-ari and eliminate the Brit in the opening round. Renicks suffered from the “luck of the draw” as she came up against the European Championships Silver medallist in the form of Eva Csernoviczki from Hungary. Renicks looked energetic early on and tried to put Csernoviczki under early pressure but she was wise to her tactics. As the contest wore on, both athletes were awarded a pair of shidos but Csernoviczki spotted her moment and countered an attempted throw by Renicks to register waza-ari before finishing the contest moments later. Join us tomorrow when Alice Schlesinger (-63kg), Lubjana Piovesana (-63kg), Sally Conway (-70kg) and Danny Williams (-73kg) all line up for GB Judo looking to add to Giles’ medal. Action gets underway from 9:30am, stay tuned to the British Judo social media channels for full text commentary.